Photograph developed September 1968, identified as the Whites Canyon intersection. 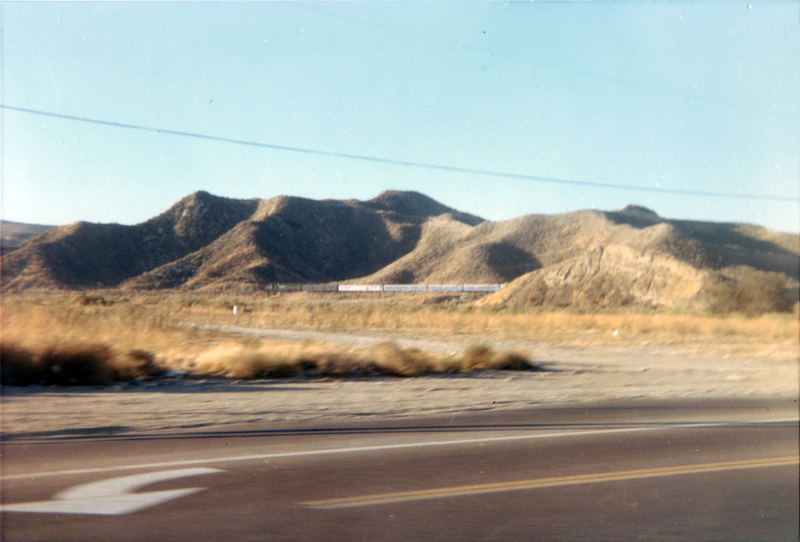 The date and the train in the distance tell us it's the intersection of Soledad Canyon Road and Whites Canyon Road in Saugus (later called Canyon Country), looking south. The street would be eastbound Soledad; the arrow indicates a left turn onto Whites, which is at the photographer's back — as is the North Oaks housing tract, which started construction in 1961. That's an eastbound Southern Pacific passenger train; the SP discontinued passenger service less than three years later on May 1, 1971, when Amtrak took over long-distance passenger service in the United States. Today this view would show a four-way, signalized intersection at left, with a bridge over the Santa Clara River (which lies between the photographer and the train, not really visible from this camera angle), and the train would be obscured by a shopping center built in 1975-1976.